My husband and I are ready to apply for a renovation loan & based on Moneysmart.sg DBS's renovation loan is the "cheapest" in terms of overall interest rate charged for the entire loan term. However, my husband and I both started a new employment with less than 3 months' salary credited into our accounts. My husband is 2.5 months into his new employment and I was just 1 month into my new employment. So we decided to apply for the loan using him as the sole applicant as his 3rd month's salary is at the end of December and his CPF would be credited on the 6th of January. Both of us fit into the criteria of having a minimum of 24,000 p.a. salary each. 1st of all, we applied for the loan online and was assigned to Mr. A for our application. Mr. A is a renovation loan specialist who is supposed to help us and guide us through the application. We filled up the form diligently and sourced for all required documents. I took photos of the documents and send it to Mr. A to vet. Mr. A told me that the documents I sent to him were sufficient. So I took leave from work to send the documents to the branch (as told by Mr. A). Side note: Other banks does not require for us to send the documents personally to the branch. When I went down to the branch Mr. A asked me to look for Mr. B. I was greeted by Mr. B and he told me that our documents were not sufficient as there are a few missing information in the invoice from the contractor (which are minor issues such as lack of postal code and contractor's designation). I told Mr. B that Mr. A said it was sufficient and Mr. B said he has been working there for 3 years and he knows what he is doing. So he asked me to go home and prepare the documents to pass to him the following day (which means another day of leave). So I diligently followed the instructions and asked the contractor down to my place to sign the amended invoice. I went back the following day and was greeted after a 1 hour wait (which I am so chill with)... Mr. B said that my husband's CPF statement does not show 3 months of contribution from his current employer. He told us that Mr. A will have to follow up with us regarding this piece of information and we might need to provide the new statement once its ready. I agreed and waited patiently after the submission. 7 working days passed. No news were given to me. I decided to call Mr. A. He said he just received an update on the matter and will need my husband to go down to the branch to update his signature. Mr. A said any branch will do. My husband went down to the Paya lebar branch during lunch time and they told him they do not do any verification of signatures. Hence, he need to take a cab to Singpost to verify the signature. He went down and had to take a queue, waited for 1.5 hours before it was finally done. We took the extra effort to ask Mr. A if the new statement was required as it was ready. Mr. A told us it was not necessary. After another few working days, we asked for updates from Mr. A. To our surprise his reply was, "we regret to inform you that your application was rejected. please try to apply again with CPF statement reflecting 3 months of contribution." "WHAT THE F**ING F*C*?!" right? After all the trouble we went through for a stupid loan. We were rejected over this stupid matter? 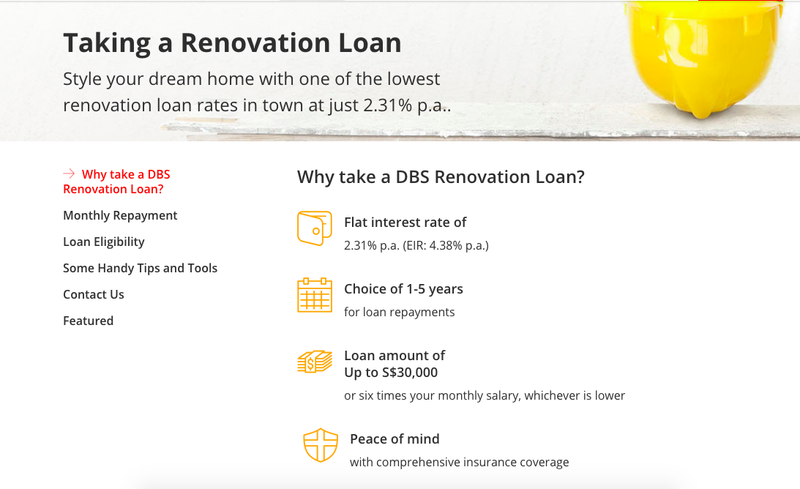 So.... =/ the conclusion is that we DO NOT recommend ANYONE to take us the DBS renovation loan as it is a very tedious process. It wasted our time, effort and money. Thanks DBS for this lesson. Apparently in 2015, someone else faced something like that from DBS too. Hope you guys have a pleasant renovation journey.